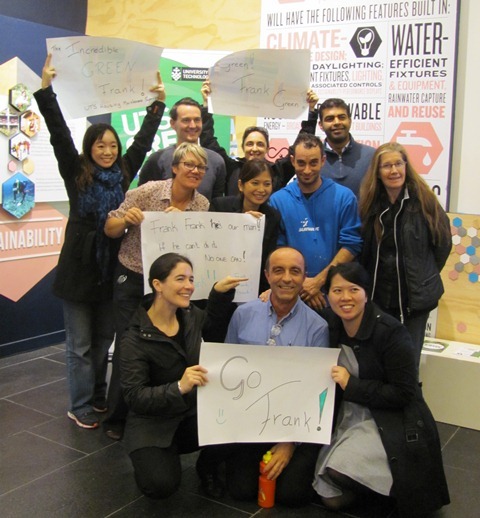 UTS hosts the annual green hero awards to recognise and celebrate UTS students, staff and alumni making a personal contribution to progress sustainability. Initiatives undertaken might include work at UTS or in the broader community. The awards aim to celebrate participation, showcase impressive initiatives and inspire others to get involved. Winners are announced each year on World Environment Day, 5 June. Winner 1st Angelica Liem is one of the most dedicated and enthusiastic UTS students working on environmental issues on campus. Her passion for climate justice and sustainability has helped revitalise the Fossil Free UTS group as well as co-ordinating the student club EcoSoc. Winner 2nd Alice McAuliffe helped establish the Waraburra Nura Indigenous plant garden at UTS containing plants native to the Sydney basin with traditional Indigenous uses. An associated website explains the properties of native species with oral recordings of Aunty Fran talking about the plants’ beneficial qualities and uses. Identify - will a wide spectrum of the UTS community identify with and be able to understand the activity. Influence - does the activity have the potential to inspire and motivate others. Involve - could the activity potentially involve others. Impact - is the activity tangible with real sustainability impacts and benefits. Equal consideration is given to initiatives of any size and scale. The judges’ decision is final and no correspondence is entered into. For more information see terms and conditions. © Copyright UTS - CRICOS Provider No: 00099F - 06 June 2018 11:57 AM. The page is authorised by Deputy Vice-Chancellor and Vice-President (Corporate Services).